It’s easy to blame most industries for a lack of respect for the environment but the Paper and Print Industry is one that has worked hard to protect it! 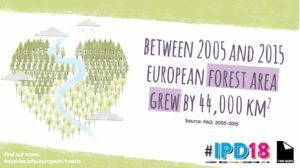 The stats behind European forestry are staggering: Between 2005 and 2015, European forests grew by 44,160km2 – that’s an area larger than Switzerland and equivalent to over 1,500 football pitches of growth every day. These areas of forestry provide a safe habitat to enable wildlife to thrive and through measured control and planning, the softwood that is harvested supplies a range of materials for industry that supports the wider economy. There are 215 million hectares of forest in Europe, which accounts for 33% of the total land area. In comparison to other regions in the world, only South America has a higher percentage of forest cover (49%) than Europe, but South America continues to lose 18.7 million acres of forests annually, the equivalent of 27 soccer fields every minute. Print Solutions Peterborough Ltd are proud to be contributing to the Global conservation effort that is forming across our industry. Our In-house production of print communications, including garments and signage endorses efficiencies in manufacturing that encourage low road miles throughout the supply chain.